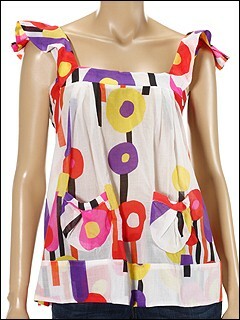 Show off your playful side with this fun and fabulous floral top by Just Cavalli™! Square neck. Flower pattern print. Deep square back. Sleeveless. Ruffles around the arms. Two lower front pockets. 100% cotton. Hand wash cold and line dry. Free shipping in the USA.